I had noticed that we had been going a little slower than usual, and I had put it down to two major reasons... Firstly, THEROS was leading the way, not UOPETA, as he was still back in Minecraftia, and THEROS wasn't the most adventurous of people that I knew. Tending to be more quiet and reserved, he didn't strike me as the trailblazer that he assumed was expected of him. Secondly, he was trying to utilise a map that he could understand, apparently, and the rest of us couldn't make heads or tails of... We had moved out from the base camp, off towards the wooden platform, following the route that was once lined with torches. THEROS had constantly kept looking at the map, and would then scan the surrounding area. It wasn't exactly encouraging, and it was beginning to dawn on me how difficult this could be, as we began to slow down. I hadn't had much time to talk with THEXIS at all since... Well, at all really... He was more secretive than THEROS, as he was constantly monitoring HoN Co. communications and was hardly ever around. However, he was accompanying us presumably as he had identified the routes the guards had taken pretty quickly, and managed to lead us back to the base camp through a new way when the guards blocked our intended path. "I know the fate of the world rests on our shoulders and all of that cliché stuff, but we haven't exactly been given much of a task. 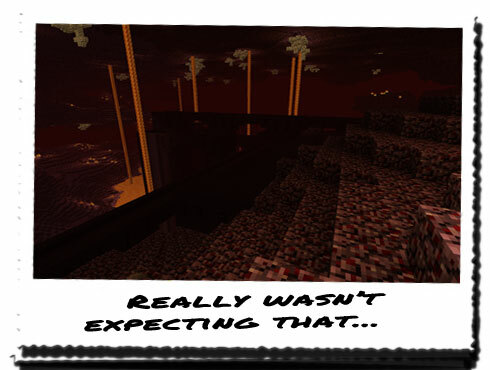 It's all very vague; go off into the Nether and find the twelve Eyes of Ender... I mean, firstly what do they look like, and secondly where do we start!" "Well yes, true. But what exactly are looking for that signifies the Ender Eyes actually there? is it just going to be an Ender Eye suspended in midair, or in a rotting chest atop a lofty pole that we can't reach...?" "According to the map, it's in a large construct... Although whether it's natural or man-made I can't make out... Not from this map." "You don't think HoN Co. have more than one base set up in the Nether, do you?" "I think it'd be worse if they're being lured to some other place. It would suggest that whoever is luring them has a use for them... Since HoN Co. seems to be the most recent addition to the Nether, I think it's safe to assume they're involved either way." "But what could they possibly have a use for pig-men and Creepers?" "Protection? Experimentation? Who knows... We all went through that hell when we found out that the Creepers had been modified... One minute they're hardly ever aggressive, and are always at least distant if thy are. The next, they're exploding, taking out massive chunks of the base and injuring us!" "Luckily for us there was only one that time... Besides, it seems they only explode when threatened or provoked. It would certainly explain why our base hasn't come under random attack since..."
"It certainly adds a whole new layer to the fight or flight response... Fight, or flight... Or BOOM! Not really a survival instinct when you come to think of it..."
A massive structure stretched out way before us, standing on huge struts that climbed large distances from the lava floor below. Epic bridges criss crossed in the distance, knitting the entire structure together, with the occasional enclosure sandwiching them all together. "I think this is what we're looking for..."